Ian and I have been kind of stingy with the wedding details. This is mainly to keep things simple and special. We're having a small wedding and we want those that are attending to be somewhat surprised (trust me... we're not really planning anything "surprise" worthy). I am going to be posting bits here and there of what we are planning. Today's bit is regarding the flower jars that will be sitting on the table during dinner. I wanted to have some small bunches of flowers down the center of the table - big enough to be noticeable, small enough that everyone can easily see over them. I also wanted a little personal touch to them. For the most part, Ian and I have already written our vows. 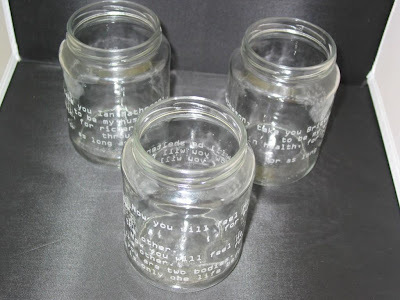 I found a vendor on Etsy that would be able to etch parts of our vows into 3 mason jars. This way we have a some momentos from the day. Below is the finished product. I wanted a typewriter font... It's not exactly what I was looking for but I still love it. We should be receiving them soon so I will post a better photo then. I love how personal you are making it. So many weddings turn into a production, they aren't unique to the couple. I LOVE this, its going to look amazing!